What does AUB stand for? What does AUB mean? 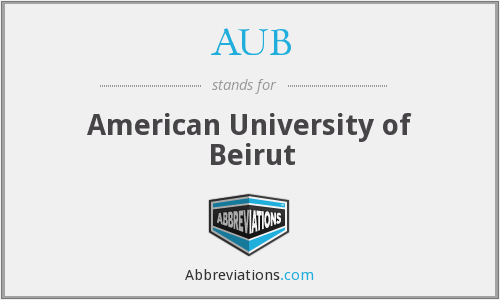 This page is about the various possible meanings of the acronym, abbreviation, shorthand or slang term: AUB. Aub ( ) is a town in the district of Würzburg, in Bavaria, Germany. It is situated 29 kilometres (18 mi) southeast of Würzburg, and 21 kilometres (13 mi) northwest of Rothenburg ob der Tauber. It is on the Gollach River, not far from the border of Baden-Württemberg. Aub is divided into three parts: Aub, Baldersheim, and Burgerroth. Couldn't find the full form or full meaning of AUB? Know what is AUB? Got another good explanation for AUB? Don't keep it to yourself! "AUB." Abbreviations.com. STANDS4 LLC, 2019. Web. 20 Apr. 2019. <https://www.abbreviations.com/AUB>.